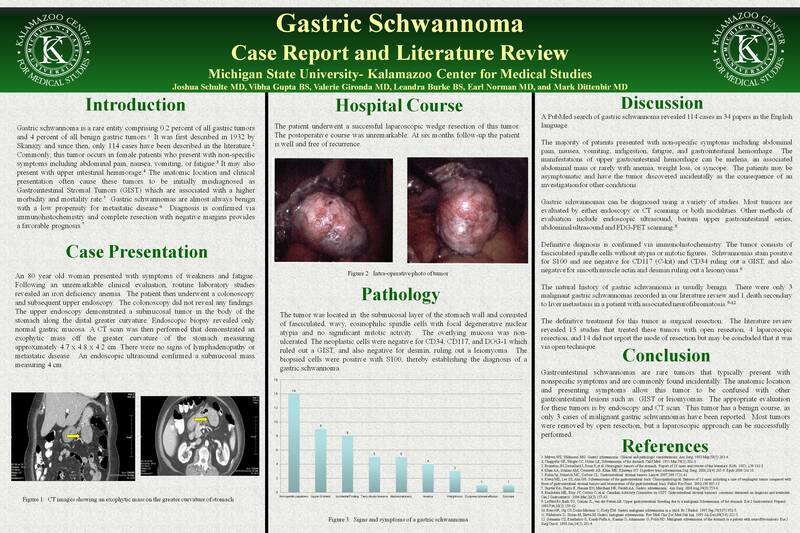 Background: Gastric Schwannomas are a rare entity, comprising only 0.2% of gastric tumors, often presenting with nonspecific symptoms such as nausea, vomiting and fatigue. Location and clinical presentation often cause these tumors to be initially misdiagnosed as Gastrointestinal Stromal Tumors (GIST); a diagnosis with a much higher morbidity and mortality rate. The primary objective of this study was to determine the evidence available for diagnosis, treatment, and outcome for this very rare tumor. We performed a literature review and describe a case report of an 80 year old female who initially presented with anemia. Methods: A Pubmed search for “gastric schwannoma” was performed with inclusion criteria for case reports published in the English language with age, gender, diagnosis, tumor size, treatment, and outcome. Results: The evidence yielded 533 results. Only three case reports in the American literature and 24 international articles met search criteria for analysis. Our case describes an 80 year old female who was evaluated for anemia. She did not have any nausea, melena, vomiting or weight loss. She underwent a colonoscopy which was normal, followed by an upper endoscopy which revealed a submucosal tumor in the distal greater curve of the stomach. Computed Tomography (CT) scan revealed an exophytic mass of the greater curvature of the stomach measuring 4.7 x 4.8 x 4.2 cm. A biopsy for suspected gastrointestinal stromal tumor revealed a tumor just beneath the submucosa with wavy eosinophilic spindle cells with focal degenerative nuclear atypia, no significant mitotic activity, and scattered aggregates of lymphoid cells. The neoplastic cells stained strongly positive for S100, definitively diagnosing schwannoma. Negative CD34, CD117, and DOG-1 effectively excluded GIST and lack of desmin excluded leiomyoma. She underwent a laparoscopic gastric resection for definitive treatment. Conclusions: Gastric Schwannomas are more common in females and presents with abdominal pain, anemia, or are found incidentally. They are usually small, benign tumors difficult to differentiate from GIST. Definitive diagnosis is with immunohistochemistry and treatment is surgical resection with a favorable prognosis.